Did you ever see that episode of Friends where Rachel is determined to finish a crossword puzzle on her own? She tells Chandler, “You know what we should all do? Go see a musical. And you know which one we should see? The 1996 Tony Award winner. 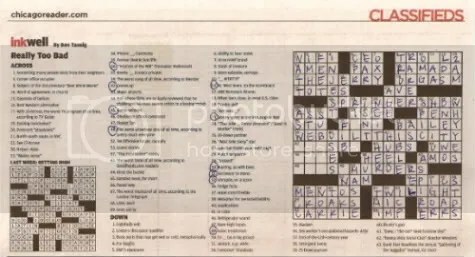 Do you happen to know the name of that one?” Of course, this was before Google made crossword puzzles completely conquerable for anyone with internet access, and while I refuse to cheat via search engine, I am not beyond soliciting a little assistance, a la Rachel’s tactic. Friday night was a slow one at B&B, so I ran over to Potbelly to pick up a Reader. After skimming the upcoming concerts (of course), I opted for the crossword puzzle. I’ve never been really big on crosswords; they always seem daunting and obscure. It’s a little discouraging when you know maybe two or three words out fifty, so I was fully prepared to give up after a couple minutes. However, when I read the clue for 39-across (the worst song of all time, according to Blender), I was hooked. For some reason my mind latches on to useless trivia like this. Hebrew verb paradigms, however, just don’t seem to stick. 🙂 Anyway, I was more than thrilled to write in “WEBUILTTHISCITY” with a pen, no less. There for awhile I thought I could maybe finish it completely on my own. But alas, I am stuck. And while I won’t Google, I will solicit input from those promising not to Google as well. 🙂 How ’bout it, friends? Wanna help me finish my crossword? It’s been almost two months, deerharas!! Time for a new post, sista! !